Sir Arthur Conan Doyle was born in Edinburgh, Scotland, in 1859. Before starting his writing career, Doyle attended medical school, where he met the professor who would later inspire his most famous creation, Sherlock Holmes. A Study in Scarlet was Doyle’s first novel; he would go on to write more than sixty stories featuring Sherlock Holmes. He died in England in 1930. 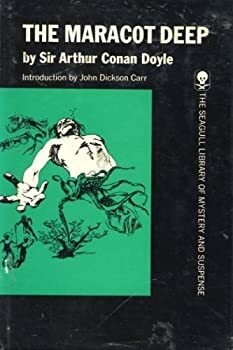 CLICK HERE FOR MORE BOOKS BY SIR ARTHUR CONAN DOYLE. The Maracot Deep: What’s doing in Atlantis NOW? Readers who know of Sir Arthur Conan Doyle through his Sherlock Holmes stories, his tales of Sir Nigel in the 14th century, the Napoleonic adventures of Brigadier Gerard or the sci-fi escapades of Professor Challenger might still be unfamiliar with The Maracot Deep. Published in 1929, only a year before the author's death, this short novel amply demonstrates that Doyle still retained all his great abilities as a spinner of riveting yarns, even in his twilight years. At a mere 140 pages, the novel(la) is a compact but densely written fantasy of the discovery of the remnants of Atlantis.